Une magnifique couleur pleine de brillance. Ce 2006 est un vin très puissant sur des arômes de fruits mûrs et de chocolat, équilibré par une acidité très présente. A attendre. Dark and still a bit reticent, with coffee, loam, bittersweet cocoa, iron and melted licorice notes holding the core of plum and black cherry fruit at bay, followed by a long, fine-grained finish. Should cellar nicely, as there's a fine, minerally spine. Coloré, gras, intense et puissant, c'est un vin de viandes rouges et de gibier. On peut le laisser en cave deux à trois ans. 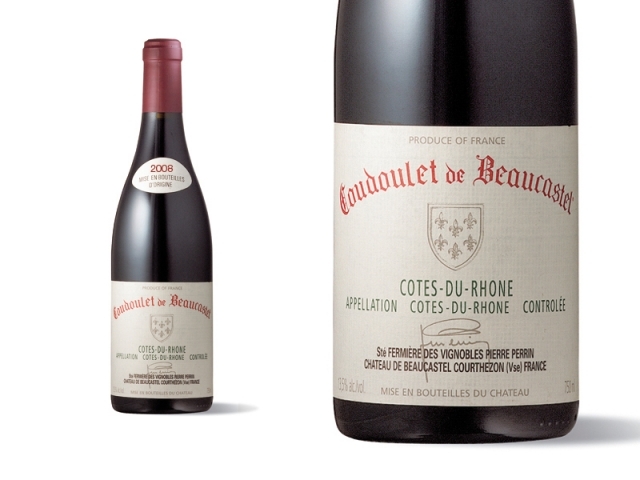 The 2006 Cotes du Rhone Coudoulet red, a beautiful, delicious, 12,500-case cuvee offering notes of root vegetables interwoven with notions of black cherry jam, licorice, pepper, and Provencal herbs. Deep and medium-bodied, it is ideal for drinking over the next 5-6 years. I tasted a representative pre-assemblage blend of 30% Grenache, 30% Mourvèdre, 20% Syrah, 20% Cinsault last December and was blown away by the value. The wine was due to be bottled in March and released in September 2008. Glowing crimson. Very charming blend with nothing out of place – wonderfully interesting and harmonious – quite a feat! Very, very good.